Thank you to all the people who crammed into Jacob’s Well on Saturday night and joined in the singing and storytelling in our York Literature Festival show, ‘Raucous Rhymes and Wonder Tales‘, exploring childhood around the world and across the centuries. 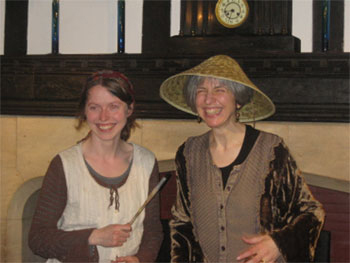 Story-teller Catherine Heinemeyer (aka Nettlefoot Kate) and I really enjoyed your company, and your wonderful imaginations! The story we all made up together included contributions from children as young 5, right up to septegenarians. It was a real ‘family event’ – and included a poem I’d written inspired by my father (called ‘Laura’ – which you can watch here), and fabulous buns made by my mum, which were much enjoyed by all! 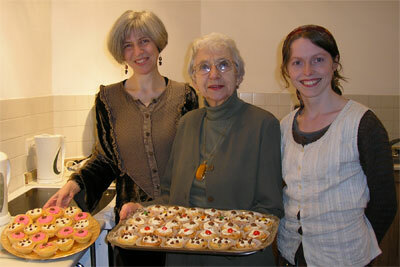 My mum with her delicious Raucous Rhymes buns! This was the world premiere of ‘Raucous Rhymes and Wonder Tales‘, and we’re now looking forward to performing the show elsewhere.